What do you call a flashlight, an auto escape tool and a durable heavy-duty stainless steel knife all in one? The Wartech Tactical Survival Knife – that's what! The Wartech Tactical Survival Knife is the most versatile knife, auto escape tool and safety protection device available. 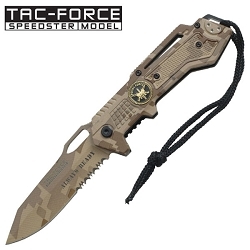 Its durable, two-tone, surgical stainless steel blade, rugged construction and multitude of different uses will quickly make the Wartech Tactical Survival Knife a must-have every time you travel. Every year thousands of vehicles roll over, trapping their occupants inside. Instead of waiting for help to arrive, you can slice through your seat belt, shatter your side window and find your way to safety. Use the Wartech Tactical Survival Knife just one time and you'll wonder how you ever traveled without it. If you're an outdoorsman or construction worker, the Wartech Tactical Survival Knife will become an everyday accessory for any task, big or small. 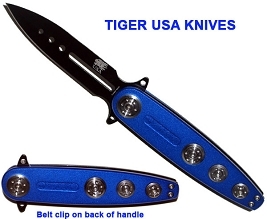 The razor sharp 3.75 inch 1065 surgical stainless steel half serrated blade can cut through just about anything. With an adjustable angle bright LED light; you'll always be able to find what you're looking for. The Wartech Tactical Survival Knife is the ultimate, compact solution for camping, hunting, hiking and general outdoor use.